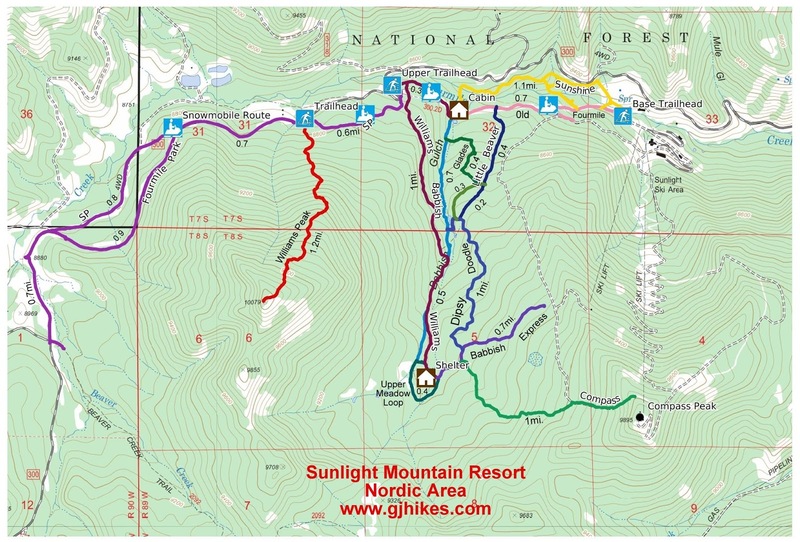 The Compass trail is located in the Sunlight Mountain Resort Nordic Area near Glenwood Springs, Colorado. It begins off of the Babbish Express trail where it climbs a steep groomed trail that takes it up to the top of the Ute downhill ski run a little below the summit of Compass Peak (9,895 feet). Even though the Compass trail is only 1 mile in length getting to and from the closest trailhead will turn it into a minimum 5.5 mile round trip excursion. The Upper trailhead off of Forest Road #300 is the closest place to start off from. To get there head west from Glenwood Springs on Highway 117 for about 10 miles and turn right onto FR #300 just before reaching Sunlight Mountain Resort. At present the trails near the trailhead aren't marked so printing out a map to bring along will come in handy. From the trailhead you will want to follow the Old Four Mile Road to the east, back toward Sunlight Mountain Resort, for about 250 feet to where the Williams trail branches off on the right at a spot that is marked with a 'No snowmobiles' sign. There is a shortcut that you can take by heading south from the trailhead for about 500 feet where the Williams trail is only 30-40 feet away. Unfortunately if you ask someone where the Williams trail is they are likely not to know which one it is since there are no trail signs so just ask them which way to the little cabin. It is 1.5 miles from the Upper trailhead to the little cabin shelter. At the shelter the Williams trail magically transitions to become the Babbish Express. The Compass trail begins on the right within a quarter mile after passing the shelter and it even has a sign marking the spot. As the Compass trail begins it immediately starts gaining elevation. The profile of the Compass trail shows how its 750 feet of elevation gain is spread out over its 1 mile length. The 750 feet isn't much by Colorado standards unless perhaps you happen to be heading uphill wearing a pair of skis. The climb isn't all blood and guts though as there are stretches where it is much more moderate. The forest is made up of mostly aspen trees near the upper end of the trail. Right around the 3/4 mile point there is a short spur trail that runs over to the Ute downhill ski run that is marked with a sign for the Compass Connector. One of the steepest parts of the Compass trail comes right at the end where it climbs up to a ridge on the side of Compass Peak and meets up with the Ute downhill. On the day that we took the photos for this post the entire mountain was enshrouded with fog that had left behind a good layer of hoar frost on all the trees creating a very pleasant wintery scene. The fog had completely burned off of the mountain for the return trip transforming the trail that was dark and hazy for the trip up the mountain into a brightly lit one for the trip down. While the Compass trail isn't open to snowmobiles it is the route that the ski patrol takes with their snowmobile to get back to their shack at the top of the mountain after taking an injured skier down to the bottom. Whether you start at the Upper trailhead or the Base it pays to arrive early in the morning on weekends to have a place to park. When the upper parking area fills up people end up parking along the sides of Forest Road #300 turning it into a one lane road. As far as the Compass trail goes it gets most of its use from backcountry skiers and snowshoers that are up to the challenge of making it to the top of the mountain the hard way. We did notice some fat tire mountain bike tracks but they turned around before reaching the top. If you would like to see it for yourself then all you have to do is 'Take a hike'.